What is the max length on a Mach 1? › What is the max length on a Mach 1? 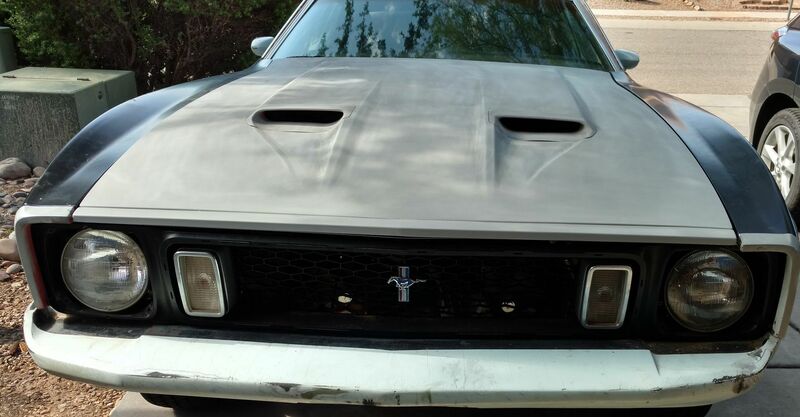 We are looking at a new (to me) house with a small garage and I am a little worried that the Mach 1 won't fit in the garage! It is measuring at 200 inches door to wall! The Mustang Data pages say the car should be 187.5 inches long. That doesn't give me a lot of wiggle room! Anyone else have a tight fit? Is the car really 16 feet long? My Sports Roof fits in my garage but no room to work on it!!! Car and Driver's original test of the 71 Boss 351 listed it at 189.5 inches long. 200 inches deep is a very shallow garage. it will be a tight fit for sure. The AMA spec shows it to be 189.5 inches. Good thing you don't have a '73, they're shown as 193.8". Any way to extend the garage? I haven't been able to in any place I've owned, either due to the way the garage attached to the house, or set-back regulations. The previous owner of my son's house was able to extend the front of his garage by about 3 feet by adding a sloped roof, the opening is in the gable end. Keep in mind the garage door might have hinges or a handle as well. So you will want to pull in a bit to make sure they don't catch on the car. Here are my garage dimensions on the side I keep my Mach w/some pics. I have 218" from door to curb in the back of garage & it's 11" from door to bumper, 18" from curb to front bumper, 13" on right side, and 41" on drivers side. It's pretty tight, but there's enough room to get around. I also have a 36" curb in front for tools, compressor, small bench & furnace. I thought I had a small space for the Mach, but 200" that is really tight. I don't know if this is any help. My trailer is 16 feet of floor. Yeah, it is gonna be tight! The garage is wide so I may be able to put it in at an angle also. It just needs to be a place to keep her out of the weather, I still have my Dad's garage to do work. That is where the 72 Coupe project resides as well!